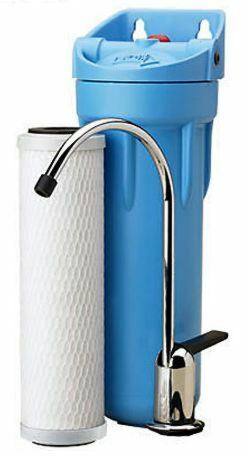 Omni Filters CBF3 Under Sink Drinking Water Filters & Purification Systems! Model CBF3 uses the leading carbon block technology to remove lead, Giardia and Cryptosporidium cysts, and volatile organic compounds (VOCs), including Atrazine (an herbicide) and Lindane (a pesticide), from your drinking water. The carbon block filter cartridge is also great at removing chlorine and odors so you get great tasting water from a dedicated faucet right in the sink. installation hardware, a long-reach dedicated faucet, pressure release valve, wrench, mounting bracket, saddle valve, and a CB3 filter cartridge. CB3 filter cartridge, K4 O-ring and OW30 Wrench. Additional cartridges and parts sold separately. Change CB3 filter every 4 months. Change tank O-ring with every 3rd filter cartridge change. The old CBF3 units used 1/4" tubing, and these lines will fit the new CBF3 Series C connections. comes with CB3 filter cartridge.